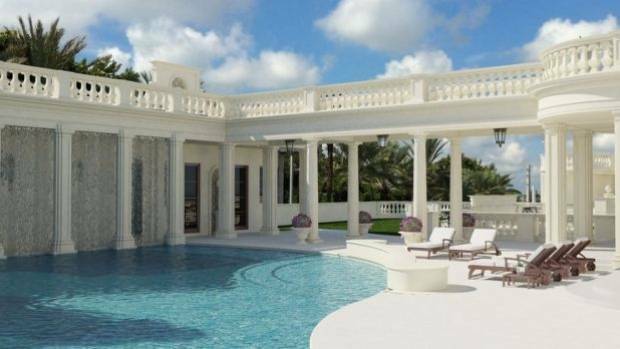 This Versailles style swimming pool is just one of many that give us serious pool envy. If there's one thing humans around the world seem to have in common, it's the love of a good swimming pool. So in the spirit of shared interests, feast your eyes on a selection of delightful sites to swim. Designed to complement the rugged terrain of the Greek island of Tinos, the Mirage house by Kois Associated Architects features a square rooftop pool that resembles a giant mirror. This surreal swimming pool is like something from a sci-fi film, bending the eye, concealing the home beneath, and blurring the line between water and sky. Because nature's swimming pools are the best kind of all. This insane 'eye of god' aerial capture by Gab Scanu of the 30-metre rock pool in Sydney's Mona Vale beach makes us want to go for a dip right now. There's something emotive about the desert that cannot be denied; juxtapose with a super-size swimming pool and you're on to a winner. Standing on the edge of the sands in Abu Dhabi, United Arab Emirates, the Tilal Liwa is the oasis of our dreams. Located in the Dolomites in South Tyrol, Italy, the Hotel Hubertus boasts a 25-metre gravity-defying swimming pool that's perched 13 metres above the ground. Suspended in the perfect spot for a magnificent view of the mountain range, the pool also features a glass window in the bottom, for those of us who want to experience the feeling of swimming in the sky. Not for the faint-hearted. An Instagram favourite, the Hanging Gardens resort in Ubud, Bali looks sublimely relaxing. Just imagine lounging in one of their modern pools while listening to the chorus of the jungle. No that's not several floors of hotel rooms, it's a pool. The boat-shaped 'sky park' at the Marina Bay Sands hotel in Singapore is the proud home of the largest, highest infinity pool in the world. Sail the skies here by visiting the observation deck during visiting hours, but if you want to swim in its lofty waters, you have to be a guest. Otherwise known as 'the abandoned hotel and pool' of El Sosneado, Argentina, the luxurious building was erected in 1938 and then mysteriously abandoned in 1953. The thermal pool however, is still pristine. Designed to utilise the sulphurous waters that tumble from the nearby Olvero volcano, the pool is constantly warm and full. Watch Berlin go by from this delightful pool nestled in the waters of the river Spree. It's an urban beach by day and a bar by night. Snow melts into clouds at the lookout of the infinity whirlpool at Hotel Villa Honegg, Switzerland. If their lavish wellness centre doesn't elevate your spirits, the view from the submerged spa pool certainly will. Though it's not a style all of us can replicate, there are undoubtedly a few lavish Queenstown homes that could take inspiration here. Crafted by renowned architect Neil Rocher, the pool of the Chongwe River House was designed with an organic frame of mind and makes the most of the local elephant population that often comes to drink at the river. This article was originally written by ANABELA REA and appeared here.